The blue boxes represent major developments in the District, the red ones in the City. All of them will put more cars and people on the same already crowded roads and in the same overstuffed buses. We need to look at the big picture and make sure it all fits. City and District planning departments don’t consider the cumulative effects on traffic of the projects they approve. 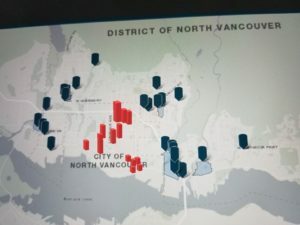 And they don’t get together to assess the impact on North Van as a whole. Developers just want their individual projects approved as fast as possible before the community wakes up and says enough is enough and pushes back on all development, good or bad. We have to get serious about making decisions about development in the City before we end up in a situation where public frustration with the apparent lack of coordinated planning and development of the infrastructure needed to support growth results in an angry rejection of all development. The first step to doing that is thinking carefully about whom you vote for in the election on October 20th. Your vote for Guy Heywood for Mayor is a vote for common sense at City Hall. good thinking Guy you have got our votes ! We need 2 more bridges off the shore. I am always in bridge traffic just to get around. I do not leave the NS very often but I am stuck in bridge traffic. If we ever have a fire we are in big trouble. Perfectly good buildings are coming down and bigger ones are going up. Please stop the density the DM has done. Are you in the real estates pockets. It looks like it to me. I am not in the real estate industry’s pocket and very opposed to the extent to which they have influence on Council. While I was on Council I opposed DM and LB’s approach to indiscriminate density. Sorry for being slow to answer your comment. Do have a solution for the number of bicycle related injuries and deaths that have occured since the increase of bicyclists have taken to our street riding along the sides of busy roads making it dangerous for drivers and cyclists alike? The best I can come up with right now is a task force comprised of city staff and bike user groups to identify and prioritize every dangerous situation and figure out the best way to make them safer. List and progress reports should be publicly available. Do you have any ideas?